The four bedrooms and the bathroom are all located on the ground floor, leading off the spacious reception hall. 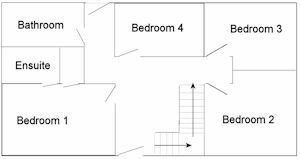 All bedrooms are carpeted and are furnished with oak bedroom furniture, which provides ample space to store clothes and personal items. 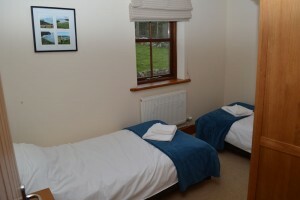 Three of the bedrooms have double beds; the smallest bedroom is a twin-bedded room. The master bedroom is furnished with an oak dressing table and matching stool, a chest of drawers and two bedside chests with table lamps. There is a built-in wardrobe with plenty of hanging space. 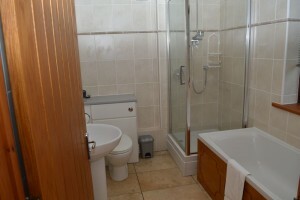 The bedroom also has an ensuite shower room, with shower cubicle, vanity wash basin and toilet. 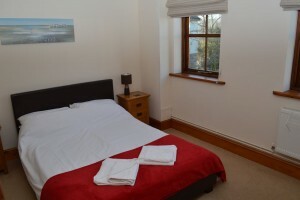 The second and third bedrooms are also double-bedded rooms, furnished in a similar style. Each has a 2 door wardrobe, chest of drawers and two bedside chests with table lamps. The twin room has a 2-door wardrobe and 2 bedside ches ts with table lamps. There is a chest of drawers in the hall near this bedroom. The family bathroom has a bath with shower attachment, a shower cubicle, wash hand basin and toilet. 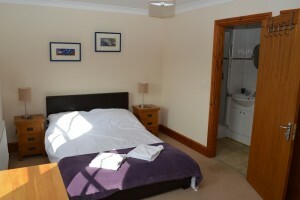 For more pictures of the bedrooms and bathroom, see the bedroom gallery page.